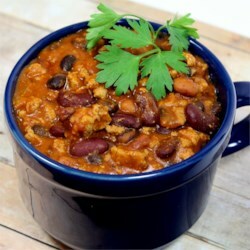 This is great chili! I made two pots two cold days in a row! I followed the recommendations of other reviewers: I used one can of diced tomatoes with green chilis in place of one can of tomato soup. I cut the chili powder in half (it was still spicy! ), added a bit of water, and added jalepenos. Yum!